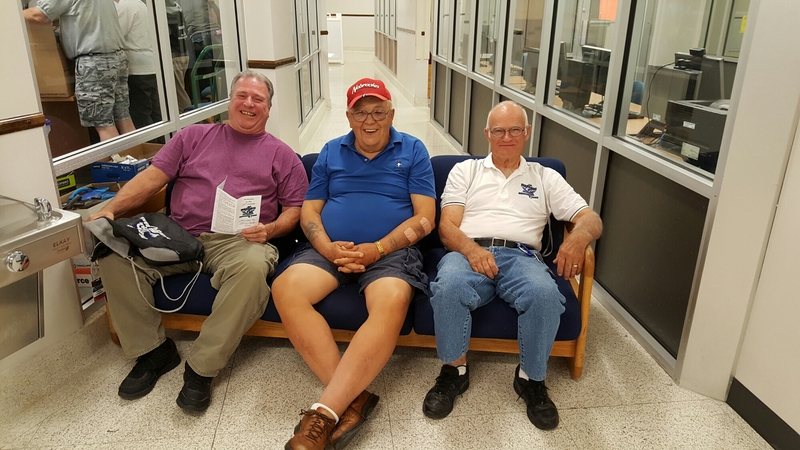 Cotner Lodge No 297 members making big decisions at the Masonic Band camp in Kearney. Fred Liebers, Ralph Riemann and Darrel Weers all serve as chaperones for the camp all week. Worshipful Master Carl Lewis (center) and brothers of Centennial Lodge No. 326 placed more than 8000 flags on the graves of veterans on May 25 in Omaha. Project Chairman W.B. Carl Diamond assembled a team including Boy Scouts, Junior ROTC cadets, lodge members, Deputy Grand Master Rick Myers and Grand Orator John Fairlie. The lodge undertakes the project each year prior to Memorial Day weekend. On May 21, 2016, Fremont Lodge No. 15 held a Veterans Breakfast. The lodges of Washington County held their annual awards banquet for 50, 60 and 70-year pins award recipients on May 18, 2016. David Dust was raised to the degree of a Master Mason at Victory Lodge No. 310 in Valley today. James Duff had been raised earlier, but due to work commitments was unable to receive the lectures. Both new Master Masons were able to enjoy the lectures. MW Dennis Rix had the honor of introducing Brother David to the setting maul. WB Rob King conferred the degree and WB K. Roger Dill raised David. Excellent work by all involved.